Spello (Perugia) every year, to adorn the path of the procession of Corpus Christi, hosts the Infiorate of Spello. As the name indicates, there are flowers arrangements made by real artists, with the collaboration of local citizens and also of visitors who arrive in Spello to admire the figurations and ornamental motifs. 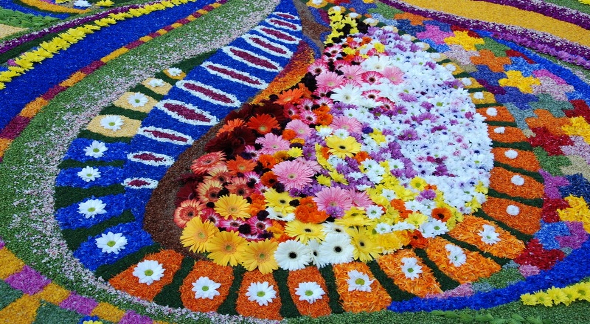 The transformation from simple distributed flowers on the pavement in real "carpet" and floral paintings took place around the nineteenth century. However, the true artistic evolution can be traced back to 1930, when a woman drew a simple figure on the street with brooms and fennel flowers. The work obtained immediately the applause of the inhabitants of the town, where they just wanted to imitate her, launching a "positive" challenge for the realization of ever more beautiful and great works, depicting Jesus and the miracle of the Eucharist with motifs of fantasy or "copying" existing paintings. Since then the Feast of Corpus Christi became a joyous occasion in which all families, and later groups of “Infioratori” more and more experienced, they could compare their works and reward those judged the bests by technical skill, precision and creativity. The Infiorate, made only with vegetable and floral elements, require a preparation work of several weeks. Then, they are completed with fresh flowers just in one night. These floral decorations have brilliant colors and refined shades, and are a masterpiece of Spello artistic imagination. 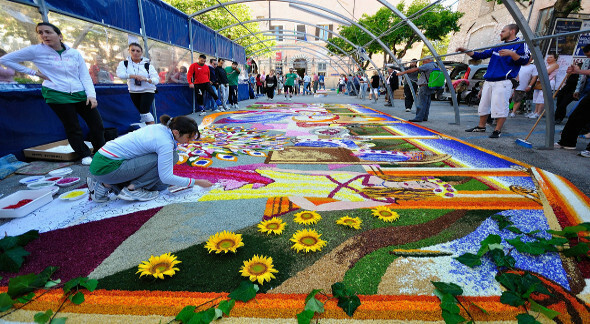 Usually the beginning of the works of the Infiorate is scheduled at 2 pm on Saturday before Corpus Christi, with the designers and the Infioratori that will start in the afternoon and will work all-night-long. The works have be completed no later than 7 am on the following Sunday. Then, a jury will review and award the best compositions. Approximately 2000 meters of carpets are branch off along all the streets and squares of Spello, in an explosion of colors and scents, creating a spectacle of great beauty. Each year during the Infiorata time is held at the Public Gardens of Spello also the Nursery-Gardening Exhibition where selected exhibitors will present their collections of orchids, cacti, carnivorous plants, roses. Infiorate of Spello are scheduled from 1st to 3rd June 2018, are you ready to feel the emotion of this unique manifestation? 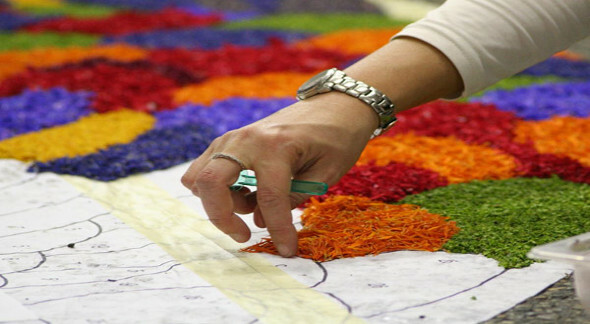 You will find there some curiosities about the preparation of the floreal carpets, all the details about the Complete Program of this current edition, some helpful informations to take part of this extraordinary manifestation and especially to become "Infioratore" just for one day!